Remembrances - Roger Ebert, Longtime Film Critic And Lover Of Cinema, Dies At 70 He was a print journalist initially, but Ebert's "thumbs up" TV critiques were just as influential as his essays, and he later carved out a prodigious digital presence. Ebert died Thursday after struggling for years with cancer. He was 70 years old. 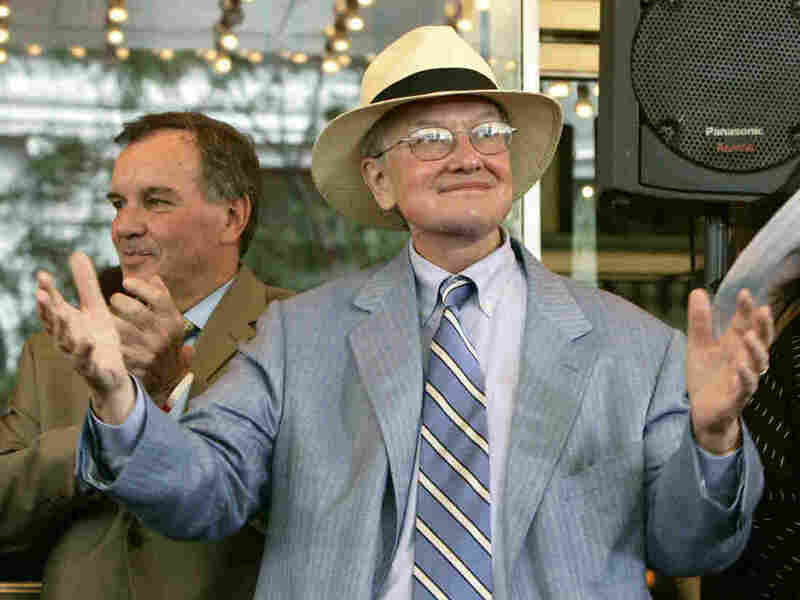 Film critic Roger Ebert acknowleges the applause of those gathered to pay tribute to him at the historic Chicago Theatre on July 18, 2005. He won a Pulitzer Prize for his writing, but just as influential as his print essays were his "thumbs up" and "thumbs down" movie reviews. 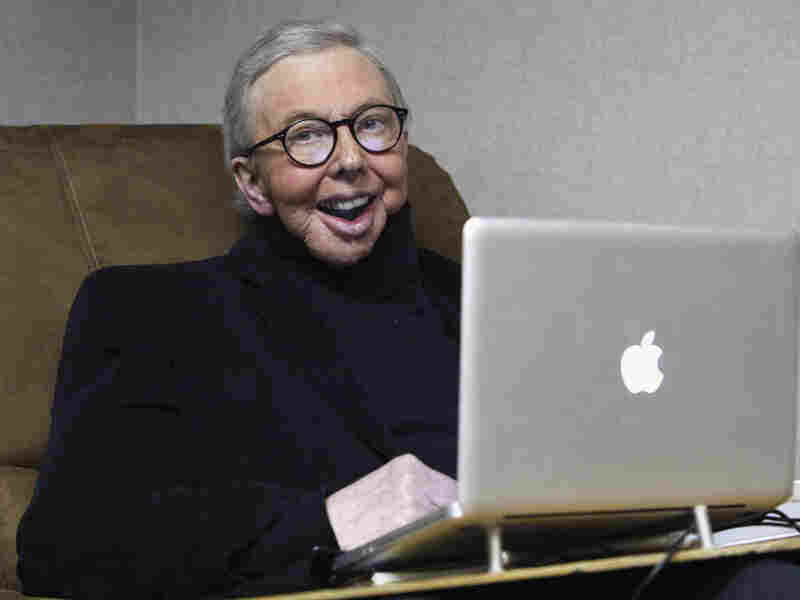 Film critic Roger Ebert died Thursday after struggling for years with cancer. He was 70 years old. His thumb may have made him famous on TV, but Ebert was first and foremost a print journalist. He worked on newspapers in grade school, high school and college. With his acumen for writing came a love of movies — and on July 12, 2005, proclaimed Roger Ebert Day by the city of Chicago, he told a crowd of admirers why movies matter. "If it's a great movie, it lets you understand a little bit more what it's like to be a different gender, a different race, a different age, a different economic class," he said. "It helps us to identify with the people who are sharing this journey with us. And that to me is the most noble thing that good movies can do — and it's a reason to encourage them and to support them and to go to them." Ebert was born June 18, 1942. By the time he was 15, he was covering high school sports for his local paper in Champaign-Urbana, Ill. He went on to become a stringer for the Chicago Sun-Times, and when the paper's film critic left, he was offered the job. Ebert works in his office at the WTTW-TV studios in Chicago on Jan. 12, 2011. "My mother's friends never knew what I did," he recalled. " 'And how is Roger?' They would have sons who were lawyers, doctors. 'And how is Roger? Is he still just going to the movies?' "
Ebert was 24, one of a crop of young critics around the country hired to cover the edgy films being made during the late '60s — movies like The Graduate, Easy Rider and Bonnie and Clyde. While writing reviews, Ebert also got some firsthand experience in the movie business, writing screenplays for B-movie king Russ Meyer. Ebert wrote the script for Beyond the Valley of the Dolls and, under a pseudonym, Beneath the Valley of the Ultra-Vixens. In 1975, Ebert became the first film critic ever to receive the Pulitzer Prize for Criticism. Although his movie reviews were syndicated, it was his television work that took the heavyset, bespectacled Ebert to a national audience. In 1978, a three-year-old local film-review show he hosted with his chief Chicago rival, the Tribune's Gene Siskel, was picked up for syndication by PBS. "What Roger brought to the show was a very clear vision of what he was trying to communicate to viewers," says Thea Flaum, the show's executive producer. "Not worried about how he appeared. Only worried about getting across what he wanted you, sitting at home watching him, to know. And that's an enormous strength — maybe it's the essence of what a great critic really is, and I think that's what made the show fly." Morning Shots: Thanks For Ruining The Entire Art Of Criticism, Roger Ebert! The show continued after Siskel's death from a brain tumor in 1999, with Ebert eventually joined by Richard Roeper. At the height of his career, Ebert wrote as many as 300 reviews a year, published books, and covered the Academy Awards and the major film festivals every year as a working journalist — all this in addition to the show. He also programmed his own film event — Roger Ebert's Overlooked Film Festival, featuring movies he considered great but ignored. Ebert not only communicated enthusiasm for mainstream movies but championed singular projects like the small documentary Gates of Heaven. The film, about pet cemeteries, made it onto Ebert's 10-best list one year. Its director, a then-unknown Errol Morris, says if not for Ebert, he might not have had a career. Ebert's encouragement about that first directorial effort made an enormous difference for Morris. "Here I had someone writing about my work who was a true enthusiast," Morris says. "His enthusiasm has kept me going over the years, and the memory of his enthusiasm will keep me going for as long as I make movies." For all of Ebert's influence, his trademarked right thumb also brought charges that he was doing a disservice to serious film criticism. Morris says that's not true. "It tells you he was a guy who could joke about himself, and if the 'thumbs up' and 'thumbs down' deal in any way suggests to people this was a person who did not take movies seriously, they are just wrong," he says. In addition to winning the Pulitzer, Ebert was the first critic to have a star on Hollywood's Walk of Fame. During a 2005 interview with NPR, he encouraged audiences to push themselves beyond Hollywood. "If you only see films about people just like yourself, why even bother to go? Because you already know about yourself," he said. "You can only find out about yourself by learning about others." Ebert was diagnosed with thyroid cancer in early 2002. After several surgeries, he was left unable to speak — but he continued to watch and review movies and carved out a prodigious digital profile on Twitter and on his Sun-Times blog. In his 2011 memoir, Life Itself, Ebert wrote about the importance of contributing joy to the world — no matter what our problems, our health and circumstances. He was happy, he said, to have lived long enough to find that out.